We're flying by the seat of our pants this week at DRUNKEN STAMPERS and bringing you an "Anything Goes" challenge...so let's see that creative mojo you've been storing up all winter and come join the crafty cocktail party! And be sure to visit my Drunken Stampers teammies to see what they have concocted for this challenge and show them some crafty lovin! I knew for this challenge I wanted to make a "double duty" card, I need a masculine birthday card for a member of my team who has a birthday later this month....why why why why do I struggle with masculine cards??? I triple stamped the cup stamp to get the cup, lid and sleeve and fussy cut the pieces. Have I mentioned how I DO NOT like fussy cutting things??? Want to play along?? 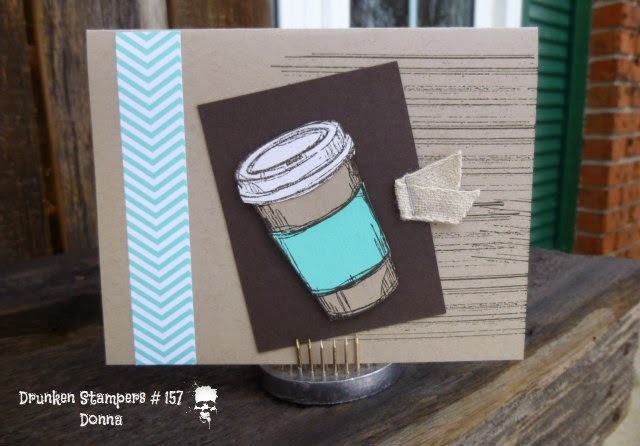 You have until 11:59 pm PST on Friday February 7 to upload your card to the Drunken Stampers Blog. Maybe YOU will be our next Life of the Party!! Great job with the masculine card, they are a tad more difficult. fussy cutting is not my friend either but ya do whatcha have to do.Did mention Fabulous card. Well, I think you nailed this 'masculine' card. Great idea to cut out the different cup pieces. Great card! Love the sketch! I have my eye on this stamp set. Cool card, love the color combination! BTW, I could use that coffee right now, well....make it an Irish coffee. After all it's 5:00 pm somewhere! Fussy cutting... I hate it too, but love the results. Such a conundrum. :D You totally rocked this masculine card! This card is such a fantastic guy card! Way to rock the fussy cutting! great card!! I have blog candy...I hope you can join in!